means " the selected" or "jewel in the Palace". In 1631 while giving birth to their fourteenth child , Mumtaz Mahal died. 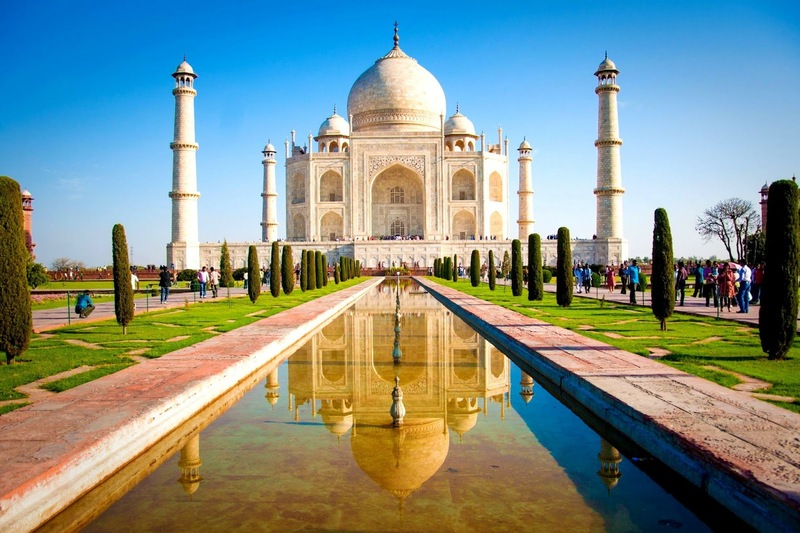 On deathbed Shahjahan promise her that he will not marries and the most expensive and greatest mausoleum on Earth will be built to her . said that Shah Jahan was broken heart of her death, where was the Royal in mourning for two years. And built one of the most beautiful Artifact in the world to commemorate the memory of his wife. Taj Mahal built entirely of white marble and consists of a group of buildings that took built 22 years (15 years for construction of the shrine and five years for the construction of minarets , mosque , the main gate and garden) was used by 22,000 workers and 1,000 elephants to transport building materials, used 28 different types of gems to studs the shrine ,Different types of marble used in the construction process and brought from various regions and countries like China, India , Afghanistan and Arabic regions. Besides the beauty of the Taj Mahal. Standing on the Western side of the shrine the mosque "Jahan NUMA" made of red sandstone. Besides the mosque there is a guesthouse and the two together constitute a stunning symmetry and balance that adds beautiful to architecture of the Crown. The Park which outlines the Crown is based on the style of Persian gardens. Built on the concept of "garden of paradise" which introduced by "Babor" to India and is symbolizes the basis of the concept of paradise in Islam water in the Centre stems from it four channels of water like four rivers in paradise : river of water , river of milk ,river of honey and a river of wine. This garden full of fruit and flowers , birds and trees. The main gate of the Taj Mahal, one five components of this edifice (the shrine ,mosque ,House ,garden and minarets). is a portal for niche, arched shape, bringing its height to the center of the building and bordered by writings in Arabic verses from the Holy Quran. Once the visitor enters the shrine. You will see a high central room which sits underneath it the burial chamber. There are many other rooms that have been used to bury the rest of the Royal family. The graves of Shah Jahan and Mumtaz Mahal was put together and decorated with verses from the Holy Quran, names of Allah , and this decoration inlaid with precious gems.